Echeveria elegans, also known as Mexican Snowball is a dense, blue-gray succulent species from Mexico that mounds or spreads slowly in tight colonies. Edges of leaves are slightly pink, producing equally pretty small pink flowers with a yellow tinge. Very handsome and uniform in the garden. Mexican Snowball is aptly named for two reasons: the succulent rosettes are an icy blue color and this species is the hardiest of the Echeveria, a genus of succulents with their center of diversity in Mexico. The low-growing clusters are very suitable to fill rock crevices and are occasionally used to cover the roof tiles of a house‐top. A layer of rosettes stapled to the roof overhang is used to hold an inch of peaty soil to the roof. It is also used to form silvery blue small borders and are believed to keep away evil spirits. Light: Grow Echeveria elegans in full sun to light shade. Water: Water moderately when in growth; not at all when dormant. 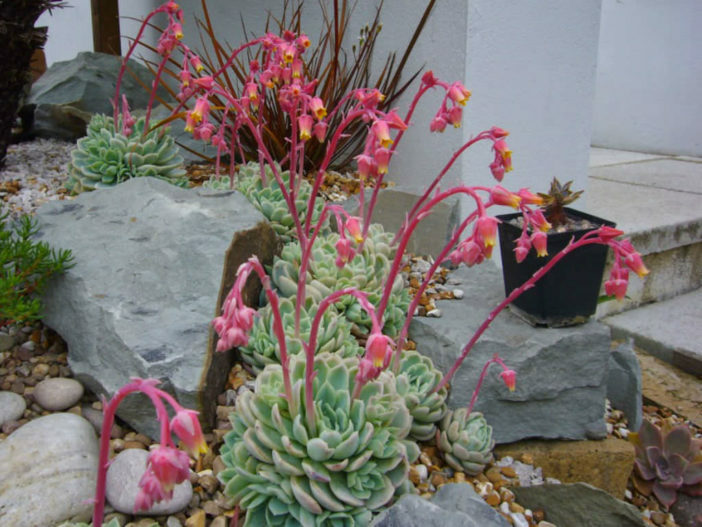 Temperature: More cold hardy than many other Echeverias, this one makes an excellent rock garden or container plant that needs occasional winter protection below 25°F (-4°C). Soil: Grow in well-drained soil. Fertilizer: Apply a balanced liquid fertilizer 2 or 3 times in the growing season. Mexican Snowball is certainly one of the most versatile neat, low-growing ground cover succulents. It is easy to care for and is a good starting point for beginning gardeners. It is considered to be drought tolerant but it does best with occasional watering in a well drained soil. This is typical of many Echeveria. They can be planted in full sun in coastal areas and they like some light shade when planted inland. Elsewhere grow as a houseplant in winter in a cool, bright window and keep dry until spring. Propagate by seed sown as soon as ripe or by root, stem or leaf cuttings in spring.